To invest successfully over a lifetime does not require a stratospheric IQ, unusual business insights, or inside information. What’s needed is a sound intellectual framework for making decisions and the ability to keep emotions from corroding that framework. This book precisely and clearly prescribes the proper framework. You must supply the emotional discipline. The investor’s chief problem – and even his worst enemy – is likely to be himself. (“The fault, dear investor, is not in our stars – and not in our stocks – but in ourselves” …) [Hence] by arguments, examples and exhortation … we hope to aid our readers to establish the proper mental and emotional attitudes toward their investment decisions. We have seen much more money made and kept by “ordinary people” who were temperamentally well suited for the investment process than by those who lacked this quality, even though they lacked an extensive knowledge of finance, accounting, and stock-market lore (The Intelligent Investor, p. 8; see also pp. 120-121). Perhaps because neither The Intelligent Investor nor Security Analysis (1934 and subsequent editions) used the term, and these days few people would properly understand it if they had, investors don’t recognise how much Stoicism influenced Graham. This ancient philosophy mitigates the influence of passion upon thought and action. (As we’ll see, Stoics’ definition of “passion,” among other things, differs greatly from the contemporary one.) Stoicism encourages the self-control that reasonable decisions – as well as responses to unexpected developments such as panics, crises and bear markets – presuppose. By embracing reason and reducing emotion’s scope to overwhelm it, a Stoical approach increases the likelihood (assuming that the investor also adopts Graham’s and Buffett’s framework) that over time the investor will think and act sensibly. “Individuals who cannot master their emotions,” goes one insight commonly attributed to Graham, “are ill-suited to profit from the investment process.” In investment as well as theology, Gnosticism is nonsense. In other words, there simply is no secret; nor is there an easy path or shortcut. Discounting and ignoring others’ opinions (unless you’ve carefully assessed them and no matter the confidence with which prominent and influential people express them), conducting your own analyses and drawing your own conclusions – these habits of mind underpin both Stoic temperament and Graham’s conception of sensible investing. 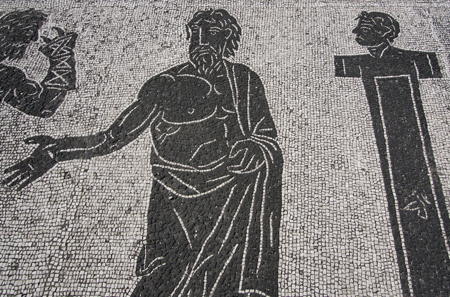 Stoicism has spiritual underpinnings: indeed, it and atheism are incompatible. Some of its foundations are in some respects similar to Christianity’s (and, for that matter, Islam’s and Judaism’s). Hence Christianity and Stoicism overlap in some significant respects. (2) Accordingly, throughout the centuries influential Christians ranging from St Ambrose to St Thomas Aquinas to Pope John Paul II have praised Stoic writings such as the Meditations of Marcus Aurelius. Be they Christians (or Jews, Hindus, Muslims, etc.) or even agnostics, an appreciation of Stoicism can greatly benefit investors – indeed, all people in many aspects of their everyday lives. Stoics understood that if negative emotions such as anger, envy, greed, fear and grief plague your life, then soundness and peace of mind will elude you. Serenity in the midst of adversity – which is hardly the same thing as the modern, Western and secular notion of “happiness” – is a necessary condition of a well-lived life. Hence many of us should consider Stoics’ practical techniques to reconsider negative thoughts and abate disruptive emotions. Stoics don’t attempt – as extreme Calvinists once did and “positive thinkers” now do – somehow to block or extinguish certain thoughts and emotions. Stoics recognise that damaging thoughts and upsetting emotions reflect our flawed human nature: hence they affect all people (albeit some more than others). Stoics show us how to reconsider our hostile reactions to certain events. In their view, harmful emotions (including fear of bear markets and recessions, the panic that occurs during financial crises, etc.) stem from illogical thinking. Once you understand that these emotions are unfounded, you’ll cease to think so unfavorably about the events that prompt them – and these happenings will less frequently and deeply disturb your equanimity. The investor with a portfolio of sound stocks should expect their prices to fluctuate and should neither be concerned by sizeable declines nor become excited by sizeable advances. Investors or not, Stoics don’t suddenly force themselves to erect a serene countenance; instead, they gradually and voluntarily disassemble the artificial (unsettled) temperament that usually surrounds and otherwise obscures our natural (calm) one. Precisely because Stoics think negatively – that is, they regularly and rationally ponder the myriad “bad” things that at one time or another inevitably happen to us – they become cheerful, peaceful and thankful. They aren’t killjoys: they appreciate and even relish the many good things – the best of which are non-material – that life offers. Yet they don’t regard leisure, luxury, wealth, etc., as good things per se; hence they neither crave (if they don’t have them) nor cling to these things (if they do), and they certainly don’t let material pleasures enslave them. These days, “stoical” means indifferent to “bad” emotions (such as anger, envy or guilt) or events (like the death of a spouse) as well as “good” actions (such as generosity, forgiveness or repentance) or occurrences (such as the birth of a child). The stoic allegedly represses all feelings. This modern usage, to which I’ll refer with a lower-case “s,” first – and not coincidentally – appeared in the late-16th century. The term’s ancient usage (which I’ll denote with an upper-case “S”) is quite different. Stoicism is a school of Hellenistic philosophy. Although its pedigree is Greek, we must necessarily view it through Roman lenses. (4) Zeno of Citium (now Larnaka) in Cyprus founded Stoicism. In Athens in the third century BC, Zeno taught philosophy at the Stoa Poikile (“painted colonnade” or “painted porch,” from which the school’s name derives). Three propositions encapsulate the ethics of Stoicism: first, errors of judgment produce destructive emotions; second, a sage (i.e., person of “moral and intellectual perfection”) neither commits such errors nor suffers such adverse consequences; third, and accordingly, everybody can and should adopt the sage as his model. Stoicism is not merely an abstract system of idle speculation: it’s also a practical guide to productive action. In particular, Stoics such as Seneca(5) and Epictetus(6) emphasised that because “virtue is sufficient for happiness” and “virtue is nothing else than right reason,” misfortune does not affect the sage. From the start, Stoicism was popular in Athens; later, it spread across ancient Greece; and eventually it became the foremost philosophy of the educated élite throughout the Hellenistic world and Roman Empire. Marcus Aurelius (121-180, Emperor 161-180)(7) was perhaps its most influential and certainly its most prominent adherent. Stoicism provides a three-part and unified account of the world. Formal logic, non-dualistic physics and naturalistic ethics(8) comprise this account; of these, and particularly among later (i.e., Roman) Stoics, ethics is its focus. Stoics devised various metaphors to clarify the interrelationships among the three pillars of their philosophy. They drew an analogy, for example, between their philosophy and a fertile field: “logic being the encircling fence, ethics the crop, physics the soil” (see A.A. Long, Epictetus: A Stoic and Socratic Guide to Life, Clarendon Press, 2002, p. 20). As this metaphor implies, ethics plays a central and practical role: for why tend the soil, erect a fence and sow seeds unless they produce a crop? Following Socrates, Stoics contend that an individual’s misery stems from his vices; his corruptions, in turn, derive either from his ignorance or defiance of reason, nature and God. (9) “Begin each day,” Marcus famously advised in his Discourses, “by telling yourself: ‘today I shall be meeting with interference, ingratitude, insolence, disloyalty, ill-will, and selfishness – all of them due to the offenders’ ignorance of what is good or evil.’” Stoicism teaches that virtues can surmount vices and that reason can master ignorance; specifically, it lauds reason and fortitude as means to overcome destructive actions (such as theft and violence) and the emotions (such as fear and greed) that underlie them. The four cardinal virtues of Stoicism, which reflect the teachings of Plato, are wisdom (Sophia), courage (Andreia), justice (Dikaiosyne) and temperance (Sophrosyne). By harnessing mankind’s innate – that is, God-given – capacity to reason, the individual can acquire knowledge. In principle, a man can distinguish empirical truth and logical validity from falsehood and fallacy – even if in practice he can only approximately delineate the boundary between truth and falsehood, and draw provisional conclusions about whether a given statement belongs on this or that side of the boundary. In a risky (or, depending upon your assumptions, uncertain) world, even the Stoic sage must therefore plot his course humbly. (12) That’s doubly so for the rest of us: we must constantly strive to detect and gradually weaken our many faulty premises, pretentions, etc. “It’s not what a man don’t know that makes him a fool,” wisely noted “Josh Billings,” the pen name of American humorist Henry Wheeler Shaw (1818-1885), “but what he does ‘know’ that ain’t so.”(13) If you reason validly from true assumptions, say Stoics, then you can understand – perhaps “glimpse incompletely” expresses their position more accurately – logos. And if you comprehend and practice reason and appreciate truth then, if you put your mind to it, you can become more virtuous. Straight thinking, in other words, is a necessary condition of virtue. Cleanthes(14) contended that the wicked man, who succumbs to destructive emotions, is “like a dog tied to a cart, and compelled to go wherever it goes.” The problem, noted Diogenes of Sinope, is that “bad men obey their lusts as servants obey their masters.” Because they fail to control (or even abate) their desires, their lusts control them. The wicked man acknowledges that in important respects his body must conform to the natural order; he readily agrees, for example, that he cannot violate the law of gravitation, that he is mortal, etc. Yet he emphatically denies that his actions must submit to some external ethical standard; instead, he asserts, he can devise his own morals. And in one sense he’s right: he possesses free will. But from this truth the evil man invalidly infers that he can successfully resist logos; accordingly, he invariably struggles unsuccessfully against it. In contrast, the Stoic surrenders his mind and body to nature, reason and God. “From Apollonius,” recounted Marcus Aurelius in his Meditations, “I learnt freedom of will and undeviating steadiness of purpose; and to look to nothing else, not even for a moment, except to reason.” As a result, and in the words of Epictetus (and echoing St Paul and in diametric contrast to the modern stereotype), the Stoic is “[physically] sick and yet [temperamentally] joyful, in peril and yet joyful, dying and yet joyful, in exile and joyful, in disgrace and joyful.” Epictetus posited that the individual’s will was – or could be – “completely autonomous,” and also that the universe is “a rigidly deterministic single whole.” In other words, you certainly can choose to think and act contrary to reason; but if so you’ll not lead a virtuous life – and consequently will be miserable. If you work at that which is before you, following right reason seriously, vigorously, calmly, without allowing anything else to distract you, but keeping your divine part pure, as if you were bound to give it back immediately; if you hold to this, expecting nothing, but satisfied to live now according to nature, speaking heroic truth in every word that you utter, you will live [content]. And there is no man able to prevent this. If you have formed a conclusion from the facts and you know your [reasoning] is sound, act on it – even though others may hesitate or differ. (You are neither night nor wrong because the crowd disagrees with you. You are right because your data and reasoning are right.) Similarly, in the world of [investment], courage becomes the supreme virtue after adequate knowledge and a tested judgment are at hand. Stoics used many of the same terms that we do today, but the meanings that they and we attach to them often differ – sometimes subtly and other times greatly. For this reason, today we often comprehend Stoic terminology superficially and occasionally misunderstand it entirely. Stoic ethics teaches that if he follows logic and truth then man can free himself from his passions’ painful shackles. To grasp this point, one must first appreciate that Stoics’ conception of ethics is not the same as the modern conception (we’ll turn to “passion” shortly). Today, we regard ethics as a matter of specific thoughts and actions that by some criterion are either good or bad. In contrast, Ancient ethics are concerned not with whether specific acts are morally right or wrong. Specifically, the central concern of Stoic ethics is whether the totality of our thoughts and behavior corresponds to a specific purpose – namely, the purpose for which our Creator has created us. What, then, must a man do in order to live an ethical life? The Stoics answered unambiguously: he must live virtuously. But beware – Stoics’ and modern man’s understandings of virtue differ subtly but significantly. Today, we judge a person’s virtue by listing a person’s good (ethical) deeds and his bad (unethical) acts, perhaps weighting each action by some criterion (i.e., some good deeds are better than others, some bad acts are worse than others, etc. ), somehow adding all the ethical and unethical deeds and – even more implausibly – expressing the former net of the latter. The bigger the disparity, by this modern conception, the more virtuous is the person in question. To the ancients, this modern conception isn’t just crude; it’s absurd. Virtue isn’t a catalogue of specific episodes of past behavior: instead, it reflects your general conformity to the function for which you were designed – which is the function for which Zeus (or, depending upon the writer, Nature) designed all humans. Just as a “virtuous” hammer performs well its function – namely to drive nails into wood – the virtuous person performs well the function for which his Creator designed people: that is, to live in accordance with God and Nature. How to do that? Strive to use your faculty of reason. Our Creator has designed us to think and act rationally, i.e., live peaceably among others and interact in mutually-beneficial ways. As Marcus – whose Meditations leave the reader in no doubt that he thought poorly of most men – put it: “fellowship is the purpose behind our creation … I am bound to do good to my fellow creatures and bear with them.” If we do these things, Marcus assures us, we will enjoy “true delight.” The virtuous being accepts this truth and acts accordingly. Stoic ethics and logic are thus closely intertwined. Epictetus emphasised that virtue “is nothing else than right reason.” Stoic ethics champions the rule: in matters of thought and action “follow where reason leads.” In particular, the Stoic strives, through logical validity and empirical truth, to liberate himself from his passions. To understand Stoicism, one must appreciate that the ancient meaning of “passion” is akin to today’s conception of “anguish” or “emotional suffering.” As Stoics conceive it, a passion is a negative and unthinking – that is, an unreasoning and hence unreasonable – inner reaction to external events. Passion, by this conception, is the low road to sure misery. This ancient notion differs diametrically from modern usage, which regards “passion” as a laudable, necessary and perhaps even sufficient condition of emotional health and material success. Ancient Greeks including Stoics distinguished pathos (whose plural, “pathe,” is normally translated as “passion”) from propathos or instinctive reaction (e.g., turning pale and trembling when confronted by physical danger) and eupathos (reasoned reaction, whose plural is eupatheia). Eupathos is the hallmark of the sage (sophos). Just as passions result from faulty reasoning, eupathos is the calm that stems from sound judgments and correct reasoning. Stoics thus seek through apatheia (literally, “absence of passion”) to free themselves from emotional suffering. He who’s free of it becomes able, through the exercise of virtue (reason), to experience serenity and joy (mental health). For Stoics, the goals of attaining virtue and joy were closely intertwined; accordingly, when they discuss virtue they also discuss equanimity. Early in his Discourses, for example, Epictetus advises us to pursue virtue but reminds us that virtue “holds out the promise … to create … calm and serenity.” Further, “progress towards virtue is progress towards each of these states of mind.” Epictetus identifies calm as the result to which virtue aims. The arrow of causality also runs in the other direction: the attainment of peace helps us to pursue virtue. Consider someone whom negative emotions such as anger have distracted. This person will find it difficult to do what his reason tells him: emotions are shouting so loud that he can’t hear reason. Emotions thereby conquer reason; as a result, he becomes confused about virtue, is unable to pursue it consistently and thus fails to attain it. For the Stoics, the pursuit of tranquility comprised a virtuous circle whereby the pursuit of one helps to achieve the other. By this Stoic conception, peace of mind entails not just cognition (i.e., clear judgment) but also a specific kind of temperament (namely equanimity in the face of life’s inevitable highs and lows). For Stoics, “reason” means not just the correct application of logic but also the broader and deeper comprehension of logos – that is, conformity, humble submission to and hence harmony with the divine universal reason that inheres in all things. To live according to reason and thus virtue is to live harmoniously and hence joyously with nature and God. If someone is angry, cruel, unkind, etc., it’s because, willfully or otherwise, he’s rebelling against logos – which leads man naturally to compassion, kindness and mercy. The Stoic solution to the individual’s evil and consequent misery thus comprises the examination of one’s own emotions, judgments and behavior; the determination of where they diverge from divine and universal reason; and the resolve to reform one’s emotions so that they conform better to reason. Properly understood, then, Stoicism is the diametric opposite of today’s stereotype. According to Seneca (On Tranquility of Mind), Stoics seek to discover “how the mind may always pursue a steady and favourable course, be well-disposed towards itself, and view its conditions with joy.” Seneca adds (On the Happy Life) that the Stoic “must, whether he wills or not, necessarily be attended by constant cheerfulness and a joy that is deep and issues from deep within, since he finds delight in his own resources, and desires no joys greater than his inner joys.” Along similar lines, in his Lectures Musonius Rufus tells us that if we conform to Stoic principles, “a cheerful disposition and secure joy” will automatically follow. Whenever some internal thought or external event occurs – which is almost constantly – Stoics advise that you ask yourself: “is this within or beyond my control?” They readily concede only sometimes can you influence what does and doesn’t happen to you. They hasten to add, however, that anybody can usually, at least to some extent, influence how he reacts to life’s real and imagined vicissitudes. Epictetus is more forthright: he emphatically rejects the contention (as William Ernest Henley’s poem, “Invictus,” expressed it) that we are masters of our fates and captains of our souls. Instead, we are merely actors in a play that others – namely the Fates – have written. Clear-eyed and stoic, [investors] accept, without complaint, that they face forces beyond their control, that they cannot accurately predict events, and that nothing is certain; yet they utterly reject the idea that luck, chaos, or any other external factor will determine whether they succeed or fail (Great by Choice: Uncertainty, Chaos and Luck – Why Some Thrive Despite Them All, HarperBusiness, 2011, p. 36). Epictetus’s Handbook, also known as the Enchiridion, begins with the sentence: “Some things are up to us and some things are not up to us.” From an appreciation of this obvious truth’s implications springs the state of mind – the calm or equanimity and self-control – for which Stoics are best known: why let anger or worry you those things which are beyond your control? Why try to persuade people whose acts and opinions you cannot change? As Marcus tartly concluded, “Nothing is worth doing pointlessly.” Instead, concentrate your limited time and resources upon those things over which you exert influence or can determine. Don’t fret about the countless things that always exceed your reach; instead, concentrate upon that relative handful of matters that sometimes lie partly within your grasp. If you’re busy influencing the few things you can influence, then the countless things you cannot control will recede from your thoughts – and thus neither upset nor worry you. Stoics thus counsel, in effect, that you abandon your quixotic, egotistical, exhausting and ultimately misguided and perhaps idiotic quests to change the world – which are doomed to fail because others’ thoughts and deeds beyond your control. Reform and improve yourself: and if others did so, then the world, too, might be a better place. Many passionately proclaim that they intend to “make a difference;” very few, however, humbly volunteer to do the dishes. The wise man modestly recognises that he cannot affect – never mind change – countless things. (Indeed, Stoics imply, the frustration of the average man in the street that he can’t or doesn’t always get what he wants, that others don’t or won’t do what he wants and that he can’t impose his desires upon everybody else, is simply disguised hubris that his thoughts somehow can or should transform their desires into reality.) Particularly noteworthy in this context is the unalterable reality that all things in this world are impermanent. “All things human,” Seneca wrote in To Marcia (whom we’ll meet shortly), “are short-lived and perishable.” Marcus Aurelius added that “the flux and change” in the world is neither accidental nor ephemeral, but is an essential and permanent part of Nature. As an investor, … it’s absolutely vital to separate what you can truly control from what is beyond your control. The only thing you can know for sure is that [in J.P. Morgan’s words, “prices will fluctuate”] You cannot control whether or not the market will continue to trash stocks, but you can control how you respond. Why contemplate the possibility that bad things will affect you? Why, to use modern language, think negatively? Any sensible person will occasionally ponder the many unlucky and tragic things that might befall him. He will also consider the absolute certainty that unfortunate occurrences of some kind (such as his own death) will eventually affect him. Why do Stoics advise that the sensible person should regularly cast his mind towards these things? The first reason is that a bit of forethought may provide plenty of prevention. A homeowner, for example, may consider the possibility that a burglar or intruder might enter his home, assault his nearest and dearest and steal his possessions. If he concludes that this risk is sufficiently great, he should take precautions such as the installation of deadbolts on doors, locks on windows, a security system, etc. These concrete actions “manage” or mitigate the risk that prompted the negative thoughts. Paradoxically, negative thinking can produce positive results. And positive thinkers, who purportedly somehow “will” that their home be safe, are more likely to suffer the negative consequences of their mismanagement of risk. Clearly, however, no matter what actions we take to prevent the occurrence of particular bad events (that is, however well we “manage risks”), unfortunate events of some description will certainly befall us at some point. For example, no matter how much you wish otherwise, one day both of your parents and all of your siblings and children (if any) – indeed, all of your family and friends – will die. Hence a second reason to think negatively and contemplate undesired events: if we do, then, when they eventually do occur, these things won’t affect us so badly. Hence the positive thought: thank heavens that we, too will die – and thus avoid the pain of continuous loss of family and friends. Because we expect them, when they happen these events don’t shock and distress us so much. Seneca put it thus in To Marcia: “He robs present ills of their power who has perceived their coming beforehand.” Misfortune weighs most heavily, he added in On Tranquility of Mind – positive thinkers take note! – upon those who “expect nothing but good fortune.” The critical point, which Epictetus emphasised, is that in this life nothing lasts forever and all things are perishable. If we ignore this obvious and indisputable truth, and instead assume irrationally that we’ll always be able to enjoy the things we value, then we subject ourselves to considerable distress when these valued things disappear. Stoics recommend that we contemplate the certainty that we will eventually lose all of the things and people we value. Thinking these negative thoughts, which Paul Veyne (Seneca: the Life of Stoic, Routledge, 2003, p. 178) calls the “premeditation of evils,” provides three benefits. First, it might, through preventative action, decrease the chance that some of these events occur; second, before these unfortunate events inevitably occur, we will value these things and people more highly; and third, after these events occur we will suffer less. Imagine, for example, that your wife dumps you or that your employer sacks you. If you think about it rationally, you might ask “why might she do so?” And if you consider this question dispassionately, you might confess to yourself that from your wife’s point of view you’re hardly the best husband and from your boss’s point of view you’re not a valuable employee. Why not? To answer this question honestly suggests means whereby you can mend your ways, e.g., become a better husband, more productive employee, etc. And if you put these means into action, you might decrease the likelihood that your wife and/or boss give you the boot. More generally, this “premeditation of evils” decreases the chances that “worst-case scenarios” actually eventuate. In modern terms, this Stoic technique is simply “proactive risk management.” Today’s legion of positive thinkers tries to block negative thoughts – and thereby deludes itself and fails to prepare for unwanted but nonetheless possible, likely and inevitable events. From the point of view of positive thinkers, it’s perverse and even anathema. But Stoics know it’s true: thinking negative thoughts and acting rationally in response to them helps to achieve positive (or, at least, less negative) results. So by all means let’s cherish our personal relationships. Indeed, precisely because we know that they will end one day (if nothing else, our death, which is certain, will terminate them) let’s henceforth treasure them all the more. For similar reasons, Epictetus also advocates this rational form of negative thinking. “In the very act of kissing [our] child,” he counsels in his Discourses, “we should silently reflect upon the possibility that she will die tomorrow.” In his Meditations, Marcus Aurelius approvingly quotes this advice. Knowing that you won’t have her forever, you’ll likely cherish her even more today. So forget about the Test rugby on TV and spend time with her doing what she wants to do. The implication is obvious: for the sake of you and your loved ones’ present benefit, you should contemplate your and their eventual demise. Indeed, because one day would certainly be his last, Seneca advised that his friend Lucilius live each day as if it were his last. Does Seneca thereby imply that he should undertake all kinds of hedonistic excess? After all, if this is his last day then Lucilius will pay no earthly price for any immoderation or improvidence: tomorrow he won’t have a hangover because there is no tomorrow; similarly, he need not fear the adverse consequences of sexual promiscuity, financial profligacy and so on. Anticipating St Paul and St Thomas à Kempis, Seneca condemns such behaviour. Why? Because it isn’t virtuous: we simply weren’t created to be hedonists. Hedonism is irrational; accordingly, to varying extents hedonists are miserable. To live each day as if it were your last – or that your fortune will disappear overnight – will likely prompt you to reprioritise your daily activities; it will almost certainly exert a much bigger change upon your state of mind with respect to those activities. Stoics show us that by contemplating our own death and accepting the loss of our possessions we can enhance our appreciation of and thankfulness for life. This attitude, concluded Musonius Rufus in his Lectures, will “set [you] free from the fear of death” – and of bear markets and financial crises. 2. “Overlap” does not mean “coincide.” Stoicism is pantheistic. In plain English, Stoics affirm that God exists but deny that God created the world and all things visible and invisible. Instead, they believe God is the world and all things. The idea that one God created the world is a monotheistic (i.e., Christian, Jewish and Islamic) conception. To these three faiths’ adherents, God is the Creator and the world is his creation. God, in other words, is the cause and the world – including man and his ethics – is the consequence. In sharp contrast, Stoics regarded “God” and “the universe” as coterminous and synonymous. Also, and unlike Christians, Stoics do not posit a beginning to the universe; nor is the individual’s life after death a tenet of their faith. people should resist vice and to pursue virtue. 4. Scholars usually divide the history of Stoicism into three phases: (1) Early Stoa, (2) Middle Stoa and (3) Late Stoa. Unfortunately, no complete work by any Stoic philosopher survives from the first two phases. Moreover, Romans wrote the only texts that survive from the Late Stoa. 5. Lucius Annaeus Seneca (often known simply as Seneca; ca. 4 BC – AD 65) was a Roman philosopher, statesman and dramatist. He was also a tutor, and later an advisor, to Emperor Nero – and forced to suicide as punishment for his alleged complicity in a conspiracy to assassinate Nero. Seneca wrote his essay “On the Happy Life” for his older brother Gallio – the same Gallio mentioned in Acts (18:12-16) for his refusal to try Paul the Apostle in Corinth. 6. Epictetus (AD 55-135) was a Greek sage and Stoic philosopher. He was born a slave at Hierapolis, Phrygia (present day Pamukkale, Turkey), subsequently acquired by Epaphroditus, secretary to Emperor Nero and subsequently to Emperor Domitian, and lived in Rome until his banishment to Nicopolis in northwestern Greece. His pupil, Arrian, compiled and published his writings and teachings in the Discourses. 7. Marcus Aurelius Antoninus (usually known as Marcus Aurelius) was born Marcus Annius Verus and his parents died when he was very young. First his grandfather (who ensured that Marcus received a good education) and then, when he was seventeen, his uncle (Aurelius Antonius, who had recently become emperor and had no sons) adopted Marcus. Aurelius Antonius changed Marcus’ surname and married him to his daughter. She bore him five children – none of whom survived into adulthood except the awful Commodus, who succeeded Marcus as emperor. Marcus and Lucius Verus ruled as co-emperors from 161 until Verus’ death in 169. Marcus was the last of the Five Good Emperors, and also one of the most important Stoic philosophers. Natural disasters, famine, plague and barbarian invasions blighted his reign – but didn’t disturb his composure. In 167, he left Rome to join his legions on the Danube. Apart from a brief journey to Asia to crush a revolt (whose followers he treated leniently), Marcus spent the rest of his life along the Danube. 8. In physics, dualism refers to phenomena whose properties are associated with two mechanics. Because these mechanics are mutually exclusive, both are required in order to describe the phenomenon’s behaviour. All matter, for example, has wave-particle duality. In philosophy, ethical naturalism (also called moral naturalism) claims that: (a) sentences about ethics express propositions (i.e., aren’t mere babble); (b) some propositions about ethics are true; (c) in particular, objective features of the world, which are independent of human opinion, render these propositions true; and (d) these moral features of the world can be reduced to some set of non-moral features. 9. Stoics were like virtually all ancients in the sense that few were atheists. A general spiritual tone pervades lengthy passages of major Stoics’ writings; frequent, too, are specific references to particular deities. Perhaps most notably, Epictetus mentions Zeus more than anybody except Socrates. 10. According to Stoics, the universe is a material substance, known as God (or Nature). Stoics divide it into two classes: active and passive. The passive substance “lies sluggish, … ready for any use, but sure to remain unemployed if no one sets it in motion.” The active substance, dubbed Fate or Universal Reason (Logos), acts on the passive matter. Everything is subject to the laws of Fate – including the souls of people (Stoics also thought that animals have souls). Since Reason is the foundation of both humanity and the universe, it follows that the goal of life is to live according to Reason, that is, to live a life according to Nature (i.e., God). 13. To Stoics, wisdom is the recognition that we usually know less (and often far less) than we think. Socrates claimed that he could be certain only of his own ignorance. That’s a sound basis for humility and curiosity – both of which are characterise successful investors. Indeed, investors know that the greatest danger is the “certainty” that arises from the suspension of critical thought. 14. Cleanthes of Assos (ca. 330 BC – ca. 230 BC) was the successor to Zeno as the second head (scholarch) of the Stoic school in Athens. Originally a boxer, he came to Athens where he took up philosophy. Listening to Zeno’s lectures during the day, he supported himself by working as water-carrier at night. Cleanthes preserved and developed Zeno’s doctrines; his pupil, Chrysippus, became one of the most important Stoic thinkers. ▪ Will Interest Rates Remain Permanently Low?